Modern architecture reflects the philosophy of a company and translates its values into a unique design. The interplay between different geometries and selected materials as well as the creation of special areas for communication and interaction help design inspiring working environments that are a source of identification for employees. In this context, light plays a crucial role: It enhances the appeal of rooms and fills the entire building with life. 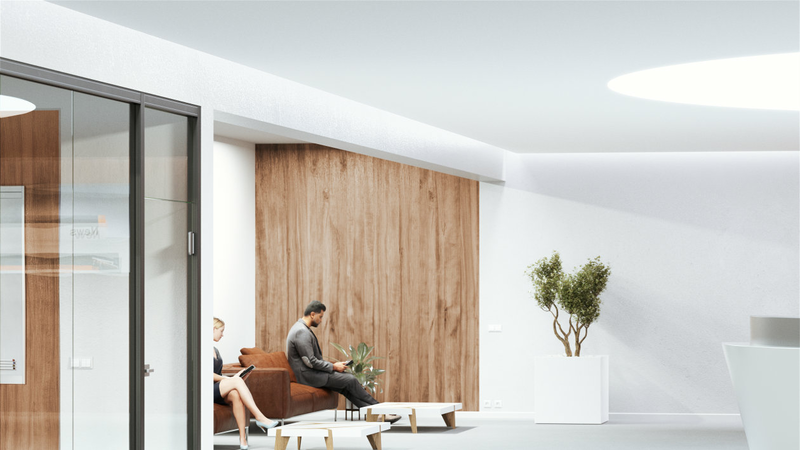 Thanks to innovative, ultra-flat and flexible lighting solutions from OSRAM, the lighting blends discreetly into the architectural concept of a room and opens up completely new opportunities for creative design. OSRAM: LED modules, however, are not the only components of a luminaire. Nicolai Heber: That’s the key issue. Today, LED modules are no longer the limiting factor. Instead, the geometries of the luminaire mainly depend on LED drivers and sensors. Another important factor are the higher requirements regarding intelligent light management. The entire hardware has to be placed inside luminaires that have to be increasingly flatter and slimmer at the same time. 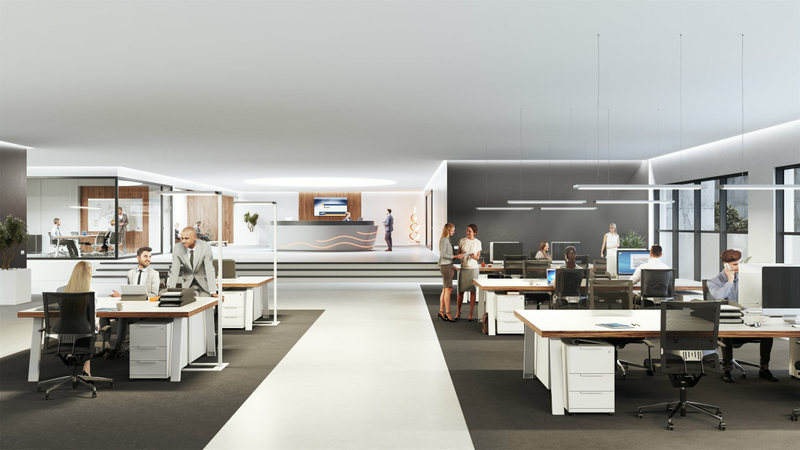 OSRAM: In other words, luminaires become more minimalistic and more advanced at the same time. How did you manage to meet the different requirements? Nicolai Heber: We simply put everything to the test. With the UltraFlat System, not only the height of the LED driver has been reduced by almost 50 %, from 21 to just 11 mm, but the UltraFlat light and presence sensor has also been perfectly adjusted to meet the new standards. In addition, the new, only 20 mm slim PrevaLED. 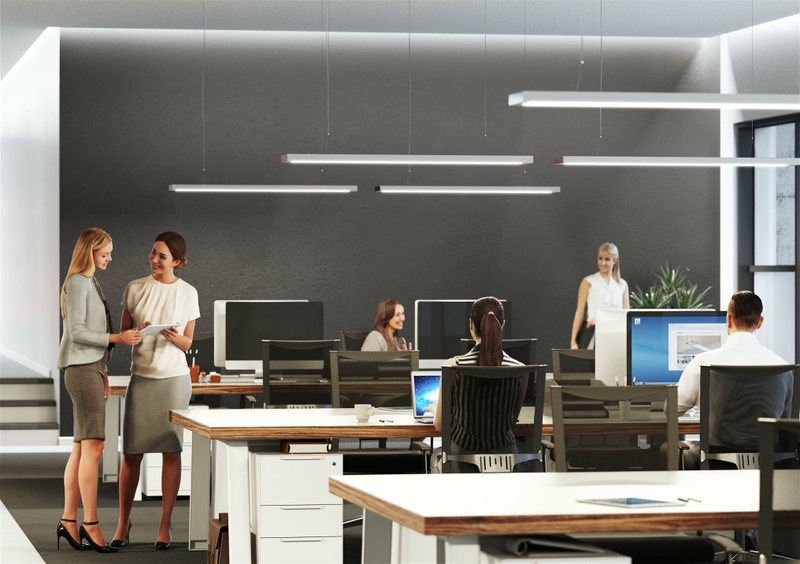 Linear LED modules complement this ultra-flat and slender system. Thanks to their outstanding efficiency of up to 195 lm/W, the broad range of different light colors and the long lifetime, these modules are an excellent choice for luminaire designers. OSRAM: This means that design freedom is a decisive advantage of the UltraFlat System. Are there further potentials? Nicolai Heber: The LED driver allows for stepless analog dimming from 1 to 100 % and offers additional integrated functions such as Touch DIM, Corridor Function and Constant Lumen Output. Moreover, we have radically simplified the programming of the driver by using NFC technology. Via the integrated NFC interface, the programmed settings can be transmitted wirelessly. Intelligent light management opens up new potentials for the demand-based control of the luminaires. For this, we offer two ultra-flat light sensors – with LEDset2 and DALI. The LEDset version, on the one hand, is the ideal solution for use in single luminaires or small applications. It can be connected directly to two UltraFlat LED drivers, e.g. for direct and indirect lighting, and allows for manual dimming as well as the storage of individual lighting levels. The DALI version, on the other hand, is addressable and can be integrated into light management systems of any size. 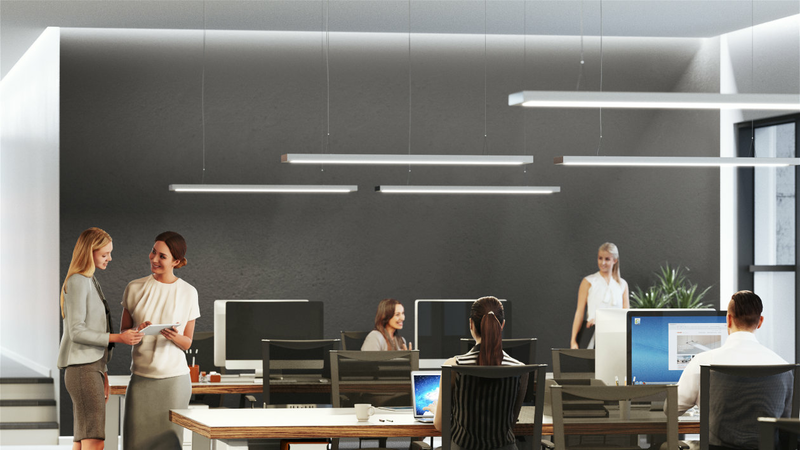 OSRAM: Modern lighting concepts go beyond the application of conventional luminaires. What trends do you see? Nicolai Heber: Light no longer only comes from conventional luminaires, it can take on many different shapes. In the course of the advancement of LED technology, the task today is to implement complete visual concepts. In addition to standard lighting tasks, light is increasingly applied to follow architectural shapes and lines in order to take the visual impression of a room to a new level. In other words, light becomes the fourth dimension. OSRAM: Does this mean that the classic relationship between luminaire and light is dissolved? Nicolai Heber: That’s right. Today, light is everywhere. Light ceilings open the space, while lines of light in ceilings, walls or handrails accentuate curved contours or emphasize linear elements. Going beyond general lighting, architecture puts the main focus on the shape of the space and the interior design. Light should rather be perceived subconsciously, while the light source disappears into the background. OSRAM: Which lighting tasks can be fulfi lled with the flexible LINEARlight FLEX. LED modules? Nicolai Heber: We really have a very broad portfolio. The modules cover a wide spectrum from brilliant white tones to Tunable White, provide effect lighting with rich colors and create a harmonious atmosphere with diffused light. Moreover, UV-resistant versions with IP67 are also available for outdoor use. OSRAM: It is often said that the installation of such systems is very complicated and time-consuming. Is this correct? Nicolai Heber: No, quite the contrary. 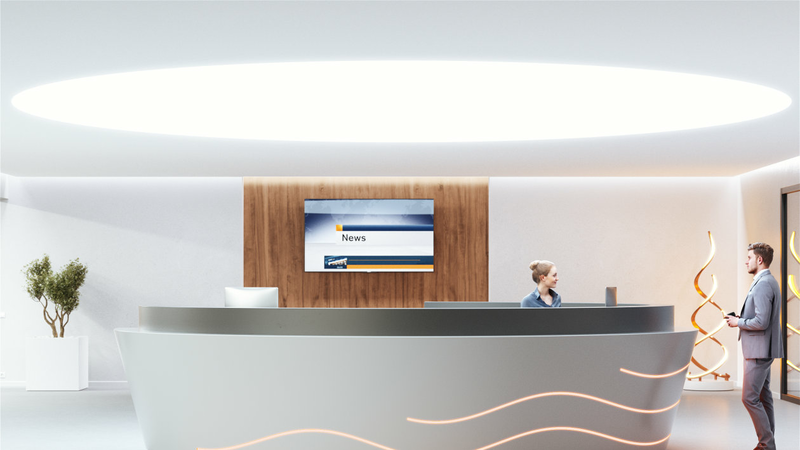 OSRAM is a onestop shop for lighting. LED modules and LED drivers as well as the corresponding light management system are for the given application. Moreover, a wide range of Flexessories, accessories for the FLEX LED modules, is available for quick and simple installation. Therefore, it’s really easy to integrate the individual components into flexible luminaires that are immediately ready for use. The design of luminaires is precisely adjusted to the shapes and materials of the interior in order to create a pleasant optical unit. With their extremely flat and slim shape, the floor-standing and pendant luminaires seem to float over the desks. This opens the view across the entire room so that the pleasantly airy atmosphere is maintained. This minimalistic design is made possible by the use of the UltraFlat System. With a height of 11 mm, it is the flattest LED driver on the market. The gained design freedom provides the basis for office concepts communicating ease and elegance without making compromises in terms of functionality and performance. In interior design, light coves open up a multitude of opportunities. The homogeneous lines of light reproduce the room geometry elegantly, creating a perfectly integrated whole. At the same time, working and meeting areas can be separated and individual elements can be highlighted for a decorative effect. Thanks to the specially developed ShortPitch LED strips, light coves in ever smaller dimensions blend elegantly into the overall ambience. Due to the short LED pitches, homogeneous light is produced even at a very close distance to the wall. The slim and flat LED drivers are also designed to avoid shadowing in the cove. 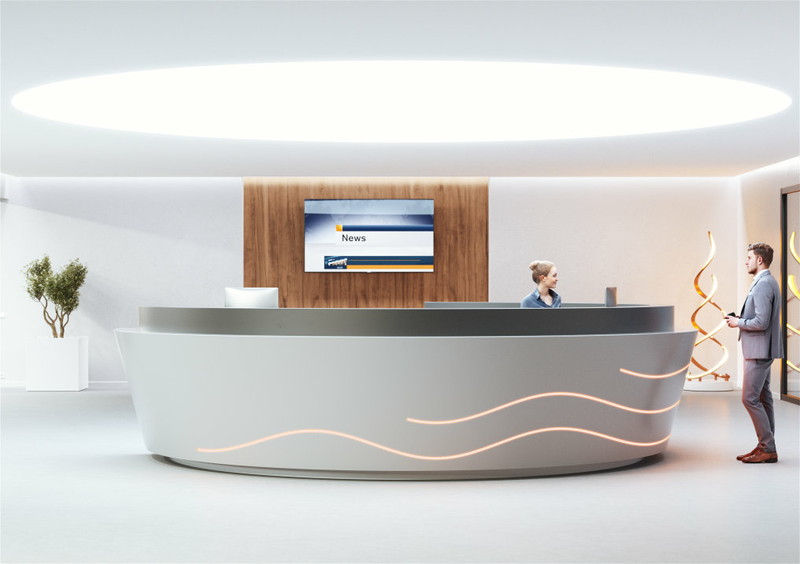 The LINEARlight FLEX LED strips can be easily adapted to curved shapes and organic structures. This way, furniture systems can also be integrated into the overall concept. The deliberate selection of color and brightness conveys the character of the furniture in an impressive way. In the design of extravagant luminaires, LINEARlight FLEX offers considerable design freedom, resulting in unique light objects that can take on almost any shape thanks to the flexible LED strips. They seem to open the ceiling so that the room appears higher and airier. Light ceilings can provide accentuation with colored effects, brightly illuminate certain areas or create a peaceful atmosphere with different tones of white. The LED modules of the BackLED family offer absolutely uniform backlighting of the entire surface.